– In various places of the dioceses of St Claude and Belley, he continues with the “wide experience” of Belleydoux: putting himself at the disposition of the parish priests, as master and catechist. At the same time he attempts to “teach others”about these same activities in founding a Congregation of Brothers. The first concrete expression of his lay religious vocation is the Brothers of Saint Joseph. – Having overcome numerous difficulties, he founds the Institute of the Brothers of the Holy Family. Bro. Gabriel could finally give flesh to his project: He sets out the identity of the Brother in the Guide, rule of life and action approved by Bishop Devie. He forms groups of postulants and novices and sends the first Brothers to the cathedral of Belley as sacristans, and as teachers to various schools. – He arrives in the bishop’s episcopal town with a numerous community. To the end of his life Brother Gabriel applies himself to the formation of his Brothers and the consolidation of his Congregation. He obtains the approval of his Institute from Pope Gregory XVI and from Charles-Albert, king of Sardinia. He frequently visits the schools and parishes where his Brothers are working. He writes a number of books for children, for young people and families in which he seeks to combine evangelisation with cultural formation. Every year he calls the Brothers together to develop a family spirit and improve their pedagogical, human and spiritual formation. He personally oversees new foundations and the construction of the Mother House. While he never lost his nostalgia for the contemplative life, which he was only able to experience in the monastery at Tamié, he nevertheless actively encouraged the Brothers in their service of Christian education in the poor parishes of the countryside and in the liturgical animation in the churches of some large towns. He was “open to all kinds of good works”. Filled with a missionary zeal, he sent four Brothers to the United States. 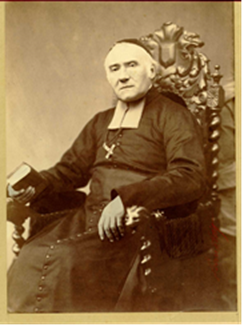 He sought help from people and institutions for his Institute; despite lack of understanding and even opposition, he found people who esteemed and welcomed his work, such as St. John Mary Vianney, the parish priest of Ars. Bro. Gabriel’s life is profoundly marked by the cross. For being a “religious Brother” he personally paid the price of a choice of life which constituted a call to greater fraternity both for the Church and for the world.